Let's face it, no one likes to type with cold fingers or have to wear 3 pairs of socks to keep their feet worm while working at their desk. 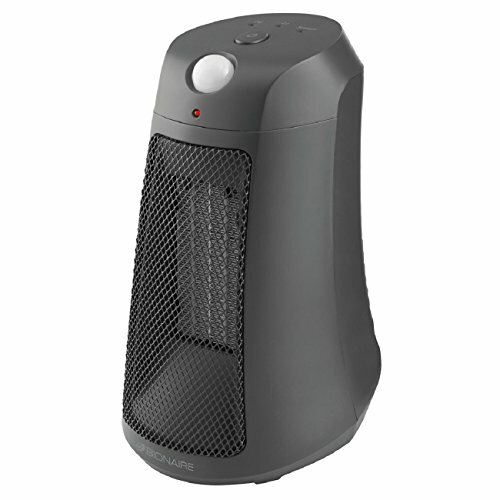 We will take a look at various heater options to help you find the perfect heater for you to use while at your desk. Directly below you will find a comparison table of the top options and further down you will find more in depth info to help you find the best option for you! Keep reading to learn more about these and other models! On cold days a low temperature at your workplace could prove counterproductive. Even on warm days you might need to tackle a frigid climate inside the office. Women in particular can feel the effects - in general they have a lower metabolism rate, so they typically need higher temperatures to feel comfortable. Offices are often on the cool side. Besides providing comfort for people, this is because of the use of computers and servers. These machines need to operate in colder temperatures for their best performance. Unfortunately, maintenance teams do not increase the temperature to beat the chill. Not all systems are designed well; heating the building is expensive; and many other factors may mean the building or floor is too cold for your taste. 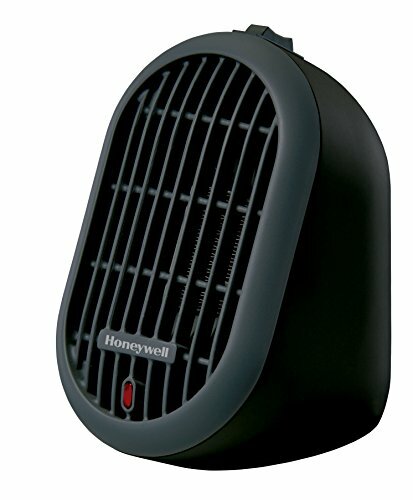 Space heaters that fit under or near the desk can literally be tucked away or placed out of the way in a corner of your cubicle. These electric heaters are small and energy-efficient so you won’t have to worry about a substantially higher electric bill. They are also safe because they don't emit any chemicals or gases and come with a cool surface. Heaters come in different sizes and shapes. Specifically, under-desk heaters are compact and typically one-tenth the size of a standard electric space heater. Because of their size they are more energy-efficient. It’s important to evaluate them based on energy efficiency, features and safety parameters. You can use the following points to help you make a decision to buy one. Approximately 10 watts of heating power is needed for every square foot. This means you can expect a 1500 watt heater to be enough for a 150 sq feet space. Of course heat rises, so high ceilings might mean you need a more powerful unit. The same is true if you’re in a particularly drafty part of the home or office. Most heaters with fans are noisier than those without fans. Fanless heaters operate nearly silently. 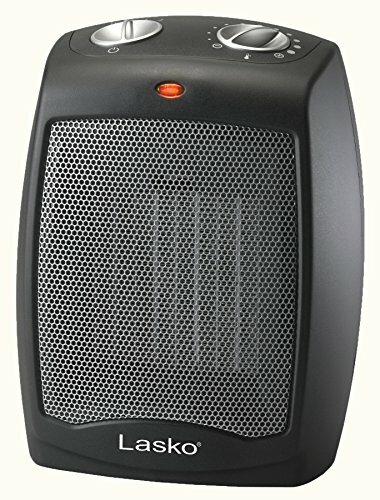 Micathermic heaters are the quietest heaters of all. For under-desk heaters, you’ll have several options for type of heating, including both convection and radiant heaters. Ceramic and infrared models are among the choices. Convection heaters include ceramic heaters. Radiant heaters are good for spot heating. 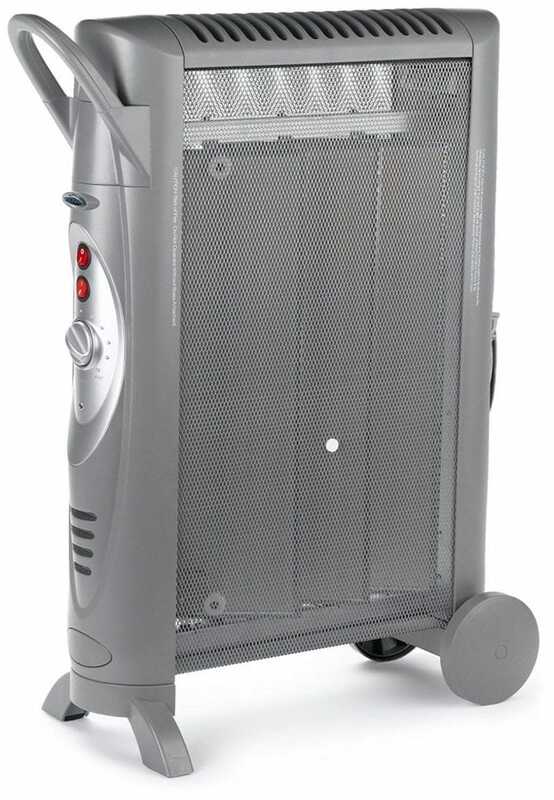 Infrared space heaters are radiant heaters that use infrared quartz bulbs as heating agents. Micathermic heaters are a hybrid models that combine the best of both convection and radiant heating technology. Personal heaters heat small spaces in a focused manner and are meant for tighter spaces. Some under-desk heaters can be placed on a night stand, table or floor. Some even have an ergonomic footrest! When considering price, don’t just look at the price tag. The efficiency, durability and warranty coverage also add to the relative value. Of course it’s always important to stay safe. Be sure to check that your heater is certified by an independent organization as being safe. Recognized testing laboratories such as UL (Underwriters Laboratory) or CSA (Canadian Standards Association) will mark a product as safe only if its construction and performance meet voluntary national safety standards. Different determinants combined together helped us in creating this list of best under desk heaters. While some made it to the list because of the technology used and heating capacity, some others made it because of the safety features and pricing. The Lasko CD09250 has a ceramic heating element with manual controls and an adjustable thermostat. Some of its safety features include automatic overheat protection and a convenient handle. It has two heat settings —1500 Watts and 900 watts. In addition it has a fan-only mode. It is available in two colors, black and silver grey. It is a priced very economically. The manufacturers also offers a 3-year warranty. Manual controls are a turn-off. 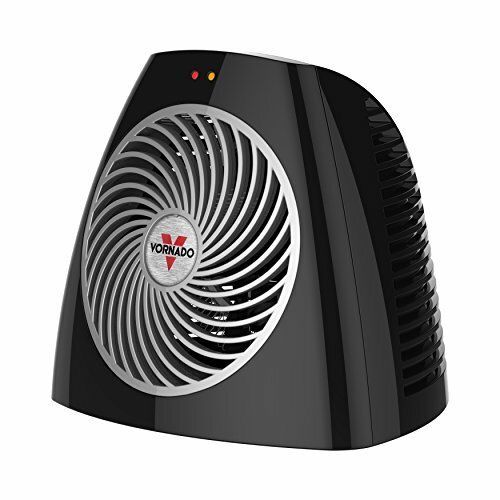 The Vornado VH202 distributes heat evenly for small or personal spaces with its Vortex technology. It has deep-pitch baldes, an air-guide enclosure and an air-density spiral grill. This unit could also be used on a table or desktop. It has two heat settings and a fan-only mode. Its safety features include a cool-touch case, tip-over protection and automatic safety shut-off system. It is backed by a 3-year limited warranty. This unit is safe as it is designed for use around kids and pets. This isn’t a travel-friendly unit. It can also get noisy at times. The Bionaire Office Heater features motion-sensing technology that automatically shuts off the unit when you’re not around. It comes with two heat settings with a maximum of 800 watts, and allows targeted heat output. A handy cord wrap keeps the cord out of way. Other safety features include overheat shutoff, manual user reset, a cool-touch exterior and auto shut-off. You get a one-year limited warranty with this. The unit has a decent heating capacity for a desk area. Also, the motion sensor technology is a big plus. A slight humming sound might disappoint you if you are looking for a hyper-silent heater. The Honeywell HCE100B provides fast and even heating using ceramic convection heating. It is an energy-efficient option with two heat settings of 170 and 250 watts. Safety features include cool-touch housing, tip-over and overheat protection. Honeywill gives you a wide variety of aesthetic options with this model. It comes in four colors: black, red, green and white. Extremely compact in size, this unit can be used on desktop or table top and for travel. You will have a quiet experience. Don’t expect it to cool your entire cubicle, as this is meant for very small spaces. The Bovado USA 166648 is a ceramic space heater with a “positive temperature coefficient” (PTC) heating system. It has internal ceramic discs for evenly distributing the heat. It’s rated up to 1500 watts. The manual controls provide two heat settings of high and low. There’s also a fan-only mode. The unit meets the safety and quality standards of the major international laboratories. Among its features that avoid overheating, burns with heated surface and accidents by tipping over. Extremely affordable and mobile unit. 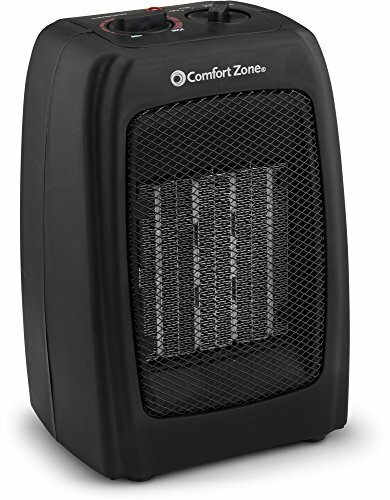 At 1500 watts, it provides a great deal of heat for its size. The fan can get noisy. Space heaters contribute to a reasonable number of fire accidents across the nation. Many of these arise from improper use. Under-desk heaters are usually electrical appliances so they carry less risk than heaters that use fuel like kerosene. Still, a few precautions and policies can help avoid injury to yourself or damage to your home or office. Keep them away from flammable liquids or any combustible material. Use only heaters certified by national bodies like UL. Avoid placing the heater in a high-traffic area. Ensure that it is turned off when not in use. Research shows that productivity at work drops when people are exposed to extremely cold temperatures for a long time. To help keep yourself comfortable and working at an optimal level, a space heater for under your desk can be a great option. Having to work is enough of a burden as it is: don’t get stuck feeling like a popsicle too!